The 21st century Fight Club, without the brain-busting plot. When Sean Arthur (Channing Tatum),an unmotivated young man who hustles counterfeit merchandise in New York City, meets seasoned street-fighting coach Harvey Boarden (Terrence Howard) by chance, his whole life changes. Sean’s fights are dangerous, but he sets out to win the prize money at stake and the respect of those around him. When I first saw this film I was saying “Oh god they decided to rip off The Karate Kid and put it along with Never Back Down”, but when I actually watched the film I was a little surprised. The fights of this movie are mainly the strong point of the film. The scenes are heavily stylized and aren’t as great until you realize they have a certain life or death consequence to actually winning them, is when you start to get into them. They are filmed very realistically of how you would feel in a fight and you can just feel the excitement with these numerous fight scenes. The fights also feel genuine, cause it shows that in the middle of a fight when you do get hit, it actually does hurt and it’s not something you just shrug off and get right back up of. There is a sense of realism within these fights and it makes the movie a whole lot of a better ride. The only problem that when these fight scenes aren’t occurring, there isn’t much really going on. The plot starts to meander and go between two stories of Tatum and his love for a waitress, his personal struggles with his father, and his relationship with Terence Howard. I felt like there were way too many scenes of this and it just became way too boring. 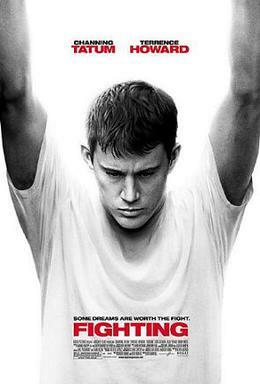 Surprisingly the strong point of this film lies within it’s charming performance from Channing Tatum. He show’s that he actually can act and carry a movie with the type of star-quality that many actors do have in big-time Hollywood. Terence Howard also turns in a very different performance, that was good but i couldn’t really tell what his intentions were at times throughout the movie, and he didn’t seem all that too interesting as he could’ve been. Consensus: Fighting has a very charming performance from Tatum, and features some stylized excited fight sequences. But the film starts to become a little too boring when it’s plot starts to unravel. I agree with your review. It was boring, unexciting and poorly acted. Also “Fighting”? That title can’t get any more bland.